The men’s volleyball team swept Cal Lutheran to move on to 7-5 on the year and No. 12 in the country. The clear and distinct difference between the two teams was the serving, with the Matadors having 11 service aces to the Knightsmen’s two. Senior Dimitar Kalachev led the team in kills with 14 while junior Ksawery Tomsia led the team with five service aces. CSUN was everywhere from the get-go, getting off to a 10-5 start, which expanded to an 18-9 lead after Tomsia scored five straight points and three straight service aces. “I think these kind of games are important for us to improve and learn something and try new things, get better for the next games and today went good,” said Tomsia. That five-point burst was critical to securing the first set for CSUN. The second set was a bit more back-and-forth than the first; however, for everything the Knightsmen threw at the Matadors, they responded and then some. The Knightsmen started the second set 4-1 and an audible “Let’s Go Cal Lu” chant could be heard from the bleachers. It wasn’t long before the Matadors tied it at six and then pulled away to win 25-15, winning the set point on a fault. The third and final set would be as close as it gets with the teams going back and forth, exchanging point for point until it was 11-11. 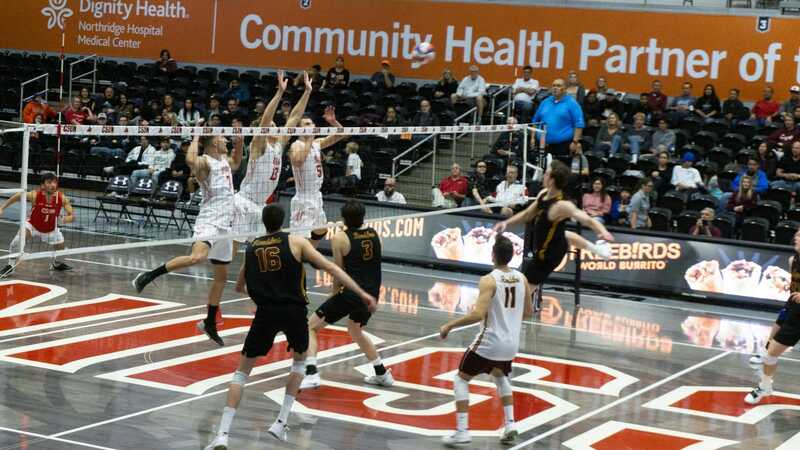 Then the Matadors gained separation with a 15-11 lead, which remained a four point lead until the Matadors won the set 25-18. Interesting to note that Tomsia sat the entire third set, but the coach indicates it had nothing to do with an injury — it was strictly strategy. “We wanted to give some other guys an opportunity,” said Campbell. Tomsia understood exactly what the coach was doing and did not take it to heart as other players might have. The Matadors have another home game on Wednesday against the Pepperdine Waves, who beat the Matadors 1-3 in their previous meeting in Malibu on Jan. 30. Matadors and Waves is set to start at 7 p.m. on Wednesday, Feb. 13.